Like everybody knows, GMA is rebooting Darna and now they are trying to be faithful to the original concept by bringing back those old classic villains. But everybody remains skeptical about the new Darna especially Marian Rivera, GMA's over exposed top star is the one chosen by GMA executives to helm the patriot's costume. But when I saw the Marian in costume for the first time, I can say that Darna is made for her. Her built is perfect. Not too fat or not to skinny. She already built some muscles on the arm that makes her very heroic. 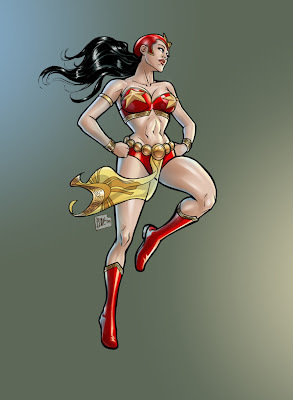 And the new Red-Gold themed costume designed by Bong Leal fits her perfectly. Now I'm curious how this new version will look like. Artwork from Bong Leal's blog.